This week was the opening of the exhibition of Diadji Diop at 55 Bellechasse. When walking in, one could only see sculptures upon sculptures. Luckily enough the artist was there himself. Diop gave me a tour around the exhibition space and gave me an explanation for each piece. 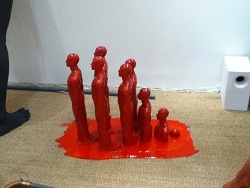 What interested me the most about his sculptures is that most of them were shiny red, it looked like fresh blood almost. I asked him about his choice in color, and why he decided to paint them all with red. He expressed that the color red is the only thing that pertains to everyone in this world, all at the same time. Why? Because red is the color of what everyone has beneath their skin, which of course he means blood. I really liked his idea on this, so the sculptures aren’t discriminated by the color of their “skin” because most of these sculptures are human molds, instead they are all united by the same color. Diop has true talent. A lot of his sculptures are displayed around Paris. For example one of his pieces is found in front of the Immigration Museum, it is of a man swimming on the ground. So check out Mr. Diops work, one can either go to the exhibition place, which is free, or even go to the Immigration Museum which is about 7 euros. I recommend to go to the Museum, since I have been there before and it is a great place to learn about the history of France in the world that is made up of colonist and immigrants.